We’d love your help. Let us know what’s wrong with this preview of Scientific Progress Goes "Boink" by Bill Watterson. To ask other readers questions about Scientific Progress Goes "Boink", please sign up. Be the first to ask a question about Scientific Progress Goes "Boink"
It just doesn't get much better than Calvin and Hobbes tbqh. Calvin is a hypocritical, imaginative, dim-whitted, self-centered, insensitive, brutish and rambunctious six-year-old. Hobbes is a sarcastic, peace-loving, supportive, somewhat phsychotic stuffed tiger. Together, the two make a whacky, noisy, messy, hilarious, unforgettable pair. That's alot of meaningless adjectives, among many, to describe two of my favorite characters in the comic strip department. This book especially had me gripped because it contained one of my favorite 'card-board box' sto Calvin is a hypocritical, imaginative, dim-whitted, self-centered, insensitive, brutish and rambunctious six-year-old. Hobbes is a sarcastic, peace-loving, supportive, somewhat phsychotic stuffed tiger. Together, the two make a whacky, noisy, messy, hilarious, unforgettable pair. That's alot of meaningless adjectives, among many, to describe two of my favorite characters in the comic strip department. This book especially had me gripped because it contained one of my favorite 'card-board box' stories, which earned it the name 'Scientific Progress Goes "Boink"'. Calvin remodels his old transmogrifier (really all he does is turn it on its side) into a duplicator. He plans to use it to make a clone of himself that will be responsible for doing all the dirty work for him. But the plan backfires, and the duplicate proves to be just as much of a lazy jerk as he is. It creates more duplicates, and each of these gets Calvin in trouble in turn. The funny thing is, by the end, after the crisis is solved, Calvin states "Okay, so we didn't learn a lesson. Sue me." to which Hobbes replies, "'Live and don't learn', that's us! ", and though it is no less than what is to be expected of Calvin, it still drives me up the wall. The other multiple, equally comical strips contained in this volume perfectly illustrate Calvin's ranting hyprocrisy, selfishness, and imagination. And yet there are also a few strips that portray a rare characteristic of his that ever little kid portrays; child innosence. 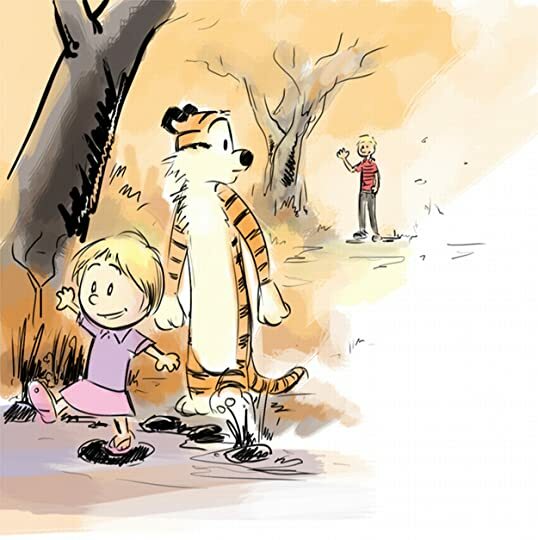 Calvin and Hobbes were a bedrock of my childhood. 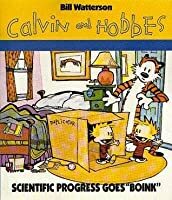 I'm estimating I've read each five times but in reality I'd just grab one at random, open at random, and then be lost in the world of Calvinball and Spaceman Spiff, Suzy Derkins and Moe, fantastic snowmen and philosophical walks in the woods with Hobbes. As a kid who lived in his imagination to escape the many difficulties of an unstable childhood and crippling depths of introversion, Calvin embodied that side of me (though I was actually mild-man Calvin and Hobbes were a bedrock of my childhood. I'm estimating I've read each five times but in reality I'd just grab one at random, open at random, and then be lost in the world of Calvinball and Spaceman Spiff, Suzy Derkins and Moe, fantastic snowmen and philosophical walks in the woods with Hobbes. As a kid who lived in his imagination to escape the many difficulties of an unstable childhood and crippling depths of introversion, Calvin embodied that side of me (though I was actually mild-mannered). 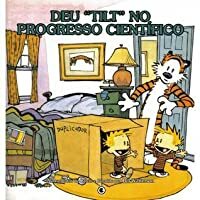 'Calvin & Hobbes' é uma das duplas mais afamadas da banda desenhada de todos os tempos, e no entanto ainda não tinha tido verdadeiramente contacto com a história destes dois pequenos traquinas que Bill Watterson nos apresenta. 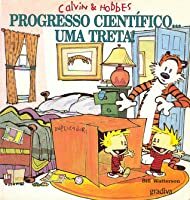 Dois livros depois, dizer que estou rendida aos seus encantos é pouco. A great book of the series again! The title story is the best of all! Calvin and Hobbes is always good for a laugh when you're down. 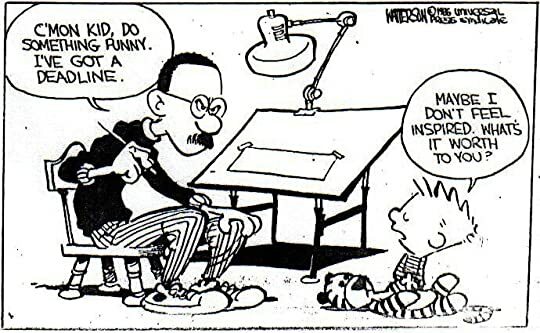 But the thing that I love most about Bill Watterson's work is that he has the ability to make you laugh and (in the middle of great big belly laughs) he can "make you go hmmm". Hilarious and thoughtful. Darn it! Can it get even better? Watterson probably has to be the best funny comic I've read. Probs the best artist and deepest. Incredible pictures of monsters and has great expression. At least tied with Larson. Another of Bill Watterson's works. The title noise is that of the duplicator producing copies of Calvin -- who didn't think how copies would act. Also appearing are dreams of waking up, snowballs, floating to the ceiling, and growing enormous. I came across this at the local Goodwill and had to see if Calvin was as funny now as I thought he was then. (1991) I am happy to say Calvin is timeless. I loved it! Giggles and smiles all the way through. As ever, this is wonderful. The strip where Calvin and Hobbes get a bedtime story about them made me wibble. I'm going to say it again: Calvin and Hobbes comics are highly intelligent AND funny! If you want exposure to some pretty awesome vocabulary, make sure you start reading comics! They are educational AND entertaining! How can you get much better than that? Back in the 1990s, I (and my boyfriend at the time) absolutely adored Calvin and Hobbes. This is was one of several books my ex had. I read it several times. And read it again in 2018. It's not so funny anymore. In fact, Calvin is a much bigger brat than I had remembered him being. Hobbes seems more spaced out than I remembered. Man, growing up ruins EVERYTHING. The one thing that hasn't changed is my appreciation for the incredible artwork Bill Watterson did for a "mere" comic strip. Ever look a Back in the 1990s, I (and my boyfriend at the time) absolutely adored Calvin and Hobbes. This is was one of several books my ex had. I read it several times. The one thing that hasn't changed is my appreciation for the incredible artwork Bill Watterson did for a "mere" comic strip. Ever look at comic page in a newspaper (any of 'em) lately? It's mainly just talking heads. Panels are so small that no details can be seen without a microscope. Even "Doonesbury" seems to be on its last legs. So, in one sense it was hard for me to look at this book now and not be sad that the comics page is just a shadow of what it once was. Storylines in this Calvin and Hobbes collection include the duplicator machine, locking the baby sitter out of the house, suddenly growing very large, suddenly growing very small, suddenly living in a world of reverse gravity and signing up for a softball/baseball team. 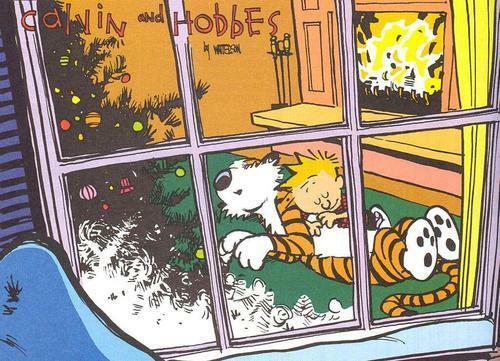 My favorites are always those wonderful snowmen Calvin creates. 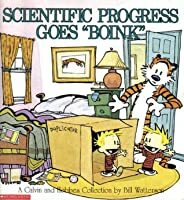 This was the Calvin and Hobbes collection that started it all for me. Sometime in sixth or seventh grade I picked up a wrinkled copy of it from my library and read the strips in no particular order. The comic is just as hilarious to me now, at thirty-seven, as it was when I was twelve, but there's also a certain sweetness and, at times, wistfulness, that I pick up on more now than I did when I was a kid. This book also goes boink. Probably. It's good, anyways. Fantastic comic strip collection. How can you not like these two?!? Just think, lots of duplicates of ME - delightful I am sure you will agree. Won't you?